Ian Clarke came up through the music scene in Toronto, studying at the Royal Conservatory of Music under the tutelage of Nellie Bard, and then TSO violinist, Arkady Yanivker. As a young violinist, he held the position of principal second in the Toronto Symphony Youth Orchestra, and was invited to perform in the National Youth Orchestra of Canada. 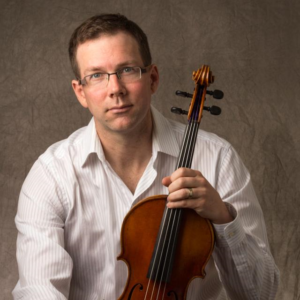 Ian was concertmaster of the Matsumoto Symphony Orchestra in Japan from 1998-2000 and is currently concertmaster of the York Chamber Ensemble and Unionville Symphonia, both orchestras with whom he is also a frequent guest soloist. In addition to orchestral playing, Ian is an avid chamber musician and performs frequently as a violist with the Canadian Sinfonietta, a Toronto based chamber orchestra, and is a founding member of the Croydon String Quartet. Ian has performed in various festivals including the Clear Lake Festival in Manitoba. He also frequently collaborates with his wife, violinist Joyce Lai.